Deadline to sign up online and pay is Tuesday, Feb 26th. Let's have a lovely afternoon amongst the flowers and learning new things. Depending on choice of transportation, we will enjoy a coffee or tea and delicious salad or dessert (or both) at the delightful Napasorn Art & Floral Café, which is located just above the flower market. Then we will take a tour with Expique Tours. 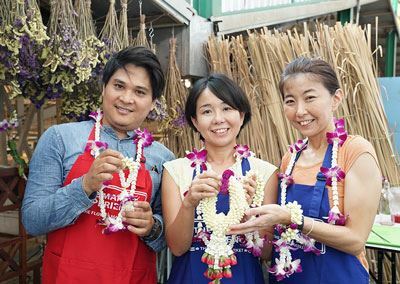 Garlands and other floral arrangements are used regularly in Thai society for religious and other cultural reasons. In our 2-hour workshop we will learn you how to make 2 or 3 garlands. The class will start with a market tour where we will pick up the flowers we are going to use during the session. Expique works with local vendors and their English-speaking staff to teach us how to make the garlands. During the workshop a selection of flower infused drinks will be served.